Majestic domes, stone arches, burr stones, axes, stone fireplaces, wooden floors and ceilings, interior gardens, cobblestone courtyards emphasize and highlight charm and tranquillity. Stay with us in the renovated, mansions – village houses all year long. Leave a unique experience and enjoy the authentic part of history on the land which was originated. Two level and one level (path) suites can accommodate, in comfort, from 2 to 6 persons each, all year around. The decoration in each one is unique and offers all modern 5 star comforts. The interior garden of 400 sq.m. 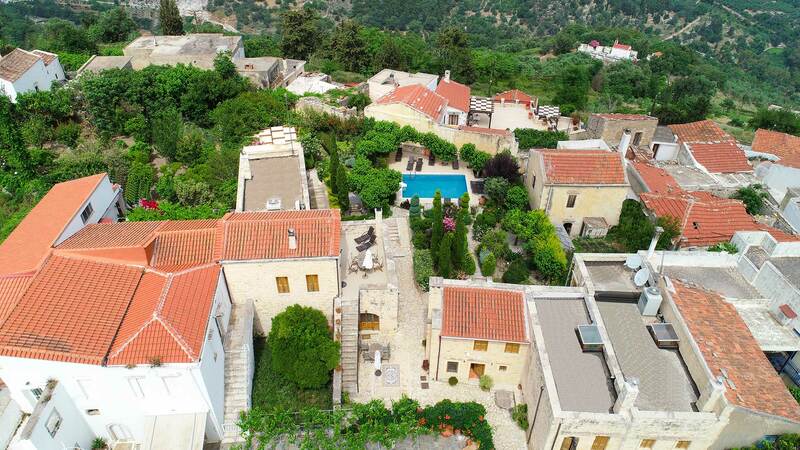 hosts: outdoor pool (40sqm), wood oven, BBQ and relaxation area. Episkopi beautiful sandy beach is only 8 km away. Suites are equipped in the living rooms with 42″ LED TV with satellite receivers (free channels), DVD players and music system. At the bedrooms the TV’s are 32″. Direct phone line at living rooms and bedrooms and voice messaging. Free Wi-Fi and Lan Internet connectivity. Safety deposit box. Kitchens inside suites are fully equipped with electric oven, dish washer, microwave, coffee maker, kettle, toaster, and fryer. Also you will find kitchen accessories to cook your delicious meal. Bathrooms are equipped with Jacuzzi bathtub, hair dryer, bathrobes, slippers towels and amenities. For your pleasant stay all year long the suites are fully air conditioned (individually controlled) and equipped with big stone fireplace (working from November until March).